Mount Pleasant Granary - Monday 21st. July, 2014 – Back to Work! Up, walked Mix and breakfasted before Rachel set off with Rowan for the canal boat to have the boat safety inspection completed. She popped into Apple at Newcastle who fixed a blip with her telephone and then journeyed on to Barnoldswick where she met with Richard the boat inspector. Everything is satisfactory, although there were a couple of small things to be put right – all of which were being done today: a new regulator for the gas bottles, a rubber pipe to be tied away from the engine, a ventilator to be screwed locked in the open position and that was about it. Having the safety certificate allows us to buy the new disc for canal travel -- and if we buy it early then we get a substantial discount. 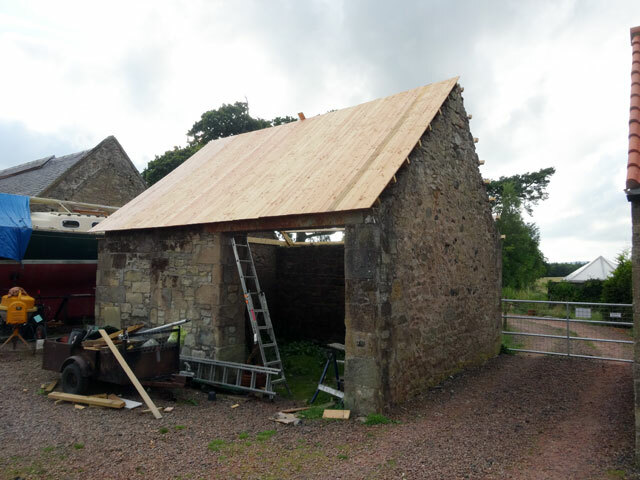 Tom and I worked on the roof of the bothy this morning (and early afternoon). By the time we were finished one side was completely covered with wood. We will start on the other side tomorrow. Later in the afternoon, David arrived and worked out how we will sort out services to the Loom Room. He will start work with us on Friday --- and I am very grateful for his help. Disappointed at England's defeat by India in the Test -- not so much by the defeat as by the way that England capitulated. I ate with Mum, Olive and Digger in the farm house and then, in the evening I relaxed – going to bed early with a book. It has been incredibly warm today – humid and sticky: but a lot better than cold and wet.